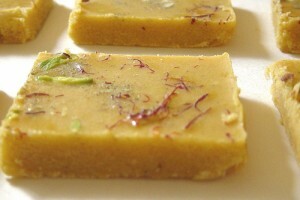 Besan Barfi recipe by Nazia Nazar at DesiRecipes.com. Delicious lip smacking sweet for all festivals. Melt shortening in a pan. Turn down heat and add cardamom and Besan. Fry, stirring constantly to prevent burning until it has changed to a brown color and smells . (Test: a few drops of water sprinkled on it splutters instantly). Turn off the heat and stir in the sugar. Spread 1/2" thick onto a platter. Cut into diamond shapes after it has cooled down. With your recipe i made Delicious besan barfi so thanks. rupinder from india verrrrrrrrrrrrry delicious recipe thank you maam. what is a shortening ? ?